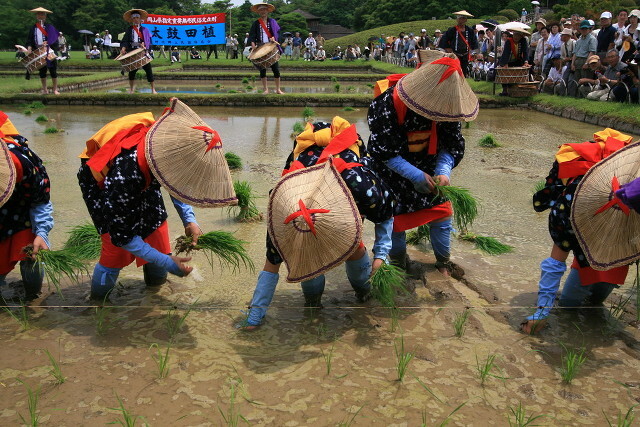 Planting rice as part of the Honedera Otaue Matsuri in Ichinoseki City, Iwate Prefecture. People of all ages join in the planting, including many pre-school age children. I’m sure I don’t need to tell you that the most important food in Japan is rice. Almost everyone eats it at least once or twice a day, and the best agricultural land is used to grow nothing else – other crops have to make do with the scraps of land left over. 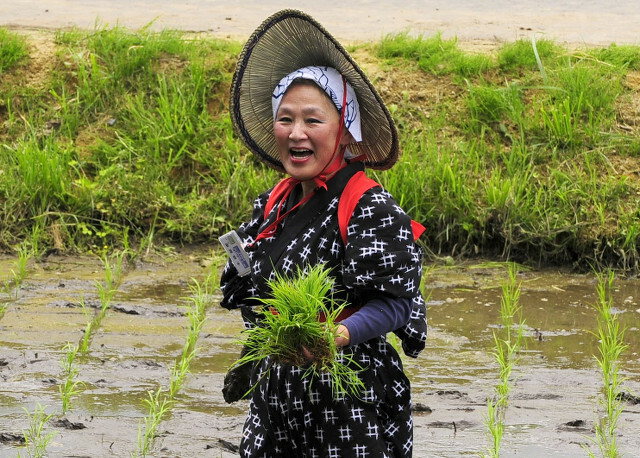 If you want to really understand the high esteem in which rice cultivation is held, you need to attend an ‘otaue matsuri’, or rice-planting festival. Hundreds of otaue matsuri are held at Shinto shrines all over Japan, many of which have their own paddy fields especially for these events. They range from small community gatherings to big public events involving hundreds of performers. Each festival is unique, but most share the same basic outline. First the participants, dressed in brightly-coloured traditional outfits, take part in a purification ritual. The priests then solemnly present rice seedlings that have been grown in a nursery to the planters, both parties bowing deeply to show respect. The planters, who are often young girls, but sometimes men or women, then proceed to the rice paddy, wade into the mud, and begin to plant the seedlings. 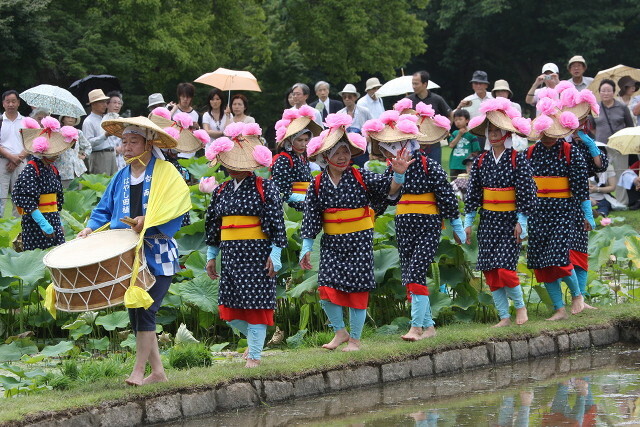 While planting is underway, a music and dance performance takes place alongside – the idea being to entertain the powerful spirits that dwell inside the rice seedlings, so enhancing their vitality, and securing a good harvest come the autumn. As the planters work across the field in lines, they sing to the seedlings, and the music and dancing continues until the brown mud is covered with bright green seedlings. After the harvest, some of the rice will be presented to the shrine’s deity as an offering, in thanks for his or her protection of the crop. Heading out to plant rice at the Korakuen Otaue Matsuri, at Okayama Korakuen in Okayama City. This festival is held each year on the second Sunday in June. Perhaps the most famous of all Japan’s otaue festivals takes place at Sumiyoshi Taisha Shrine in Osaka City. It is said to have taken place every year since 211 A.D., and is noted for its faithful reproduction of ancient rituals. Before the rice is planted, wooden ploughs pulled by decorated oxen are used to till the field. As rows of colourfully-dressed men and women plant the rice seedlings, a whole sequence of performances takes place alongside. First a group of women dance slowly and gracefully, then a solo performer dances to pray for rain. All this is accompanied by traditional instruments, including shamisen and a giant taiko drum. There’s a parade of samurai in full armour and boys with wooded swords put on a battle display. The climax of the festival is the ‘Sumiyoshi Dance’, performed by 150 girls from local elementary and junior-high schools. They dance carrying fans adorned with bells, while a man with a giant parasol taps out the time and sings. The festival at Sumiyoshi Taisha Shrine takes place every year one afternoon in mid-June. Check the shrine’s webpage here for details. The shrine is just three minute’s walk from Sumiyoshitaisha Station on the Nankai Main Line, just 9 minute’s ride from Nankai-Namba Station in Central Osaka. If you’re not in Osaka in June, look out for one of Japan’s many other otaue festivals, most of which take place between April and June. Hats like these used to be common in Japan, but now are almost only ever worn at traditional festivals. These women and girls are also taking part in Okayama’s Korakuen Otaue Matsuri.